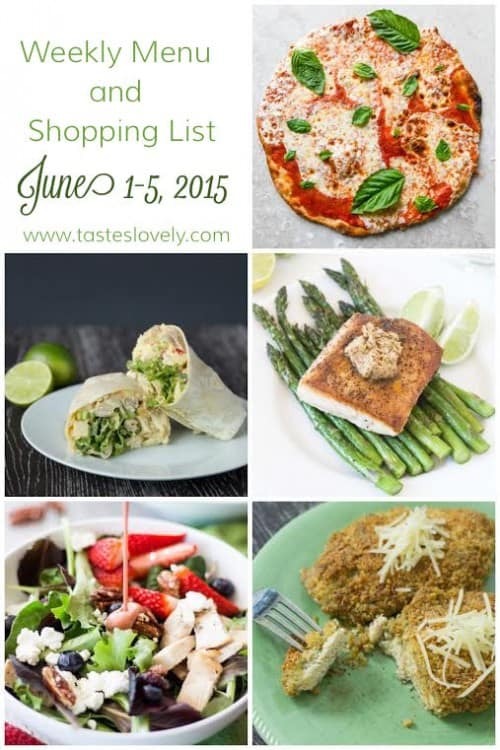 Weeknight dinner meal plan and grocery shopping list for the week of June 1-5, 2015. No Rise Thin Crust Margarita Pizza and caesar salad // A thin and crispy crust margarita pizza with a homemade pizza crust that doesn’t need to rise! Double the recipe to have 2 medium size pizzas. Serve it with a big bowl of caesar salad (chopped romaine lettuce, chopped tomatoes, grated parmesan cheese, croutons and your favorite caesar dressing). Curried Apple and Chicken Salad Wraps served with baked potato wedges // Creamy and tangy curried apple and chicken salad with romaine lettuce wrapped in a tortilla. Save time by using a store bought rotisserie chicken. Served with oven baked potato wedges. 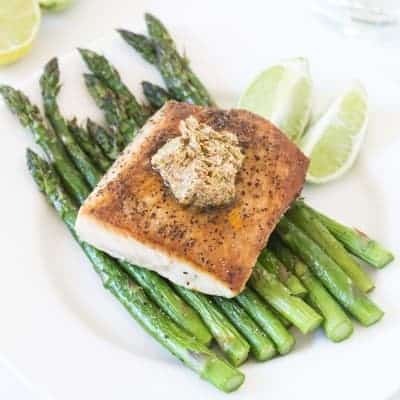 Mahi Mahi with Chili Lime Butter served with roasted asparagus and coconut lime rice // A healthy and delicious pan seared mahi mahi topped with a chili lime butter compound. Served with coconut lime rice and roasted asparagus (toss trimmed asparagus with olive oil, salt and pepper, roast at 400 degrees about 15 minutes). 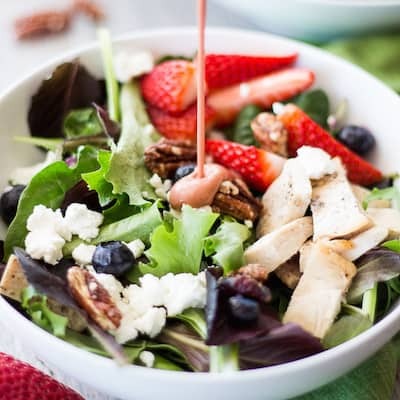 Sweet Strawberry Chicken Salad served with warm, crusty bread // A chicken and berry filled salad tossed with a sweet strawberry balsamic dressing and topped with goat cheese. Serve it with warm, crusty bread. Crispy Baked Pesto Chicken Parmesan served with creamy pesto pasta // A pesto version of chicken parmesan. 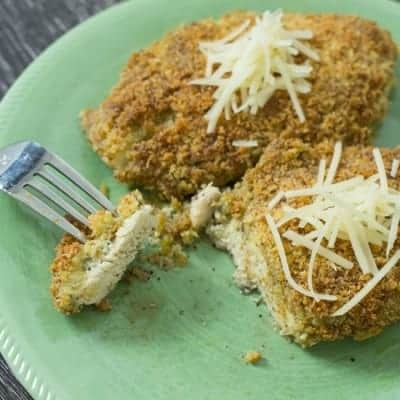 Crispy baked pesto chicken breasts served with a creamy pesto pasta. Blend the can of crushed tomatoes for the pizza sauce. Refrigerate in an airtight container. 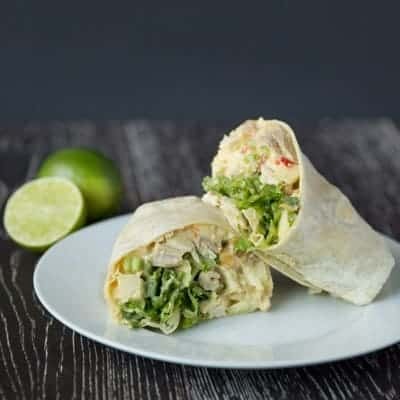 Make the curried apple and chicken salad for the wraps. Refrigerate in an airtight container. Make the chili lime compound butter for the mahi mahi. Refrigerate in an airtight container. Make the coconut lime rice for the mahi mahi. Refrigerate in an airtight container. Microwave for 5 minutes and fluff with a fork to reheat. Grill the chicken breasts for the strawberry salad. Refrigerate in an airtight container. Make the salad dressing for the strawberry salad. Refrigerate in an airtight container. This looks like the perfect menu, Natalie! I’ve definitely got to try your mahi mahi! 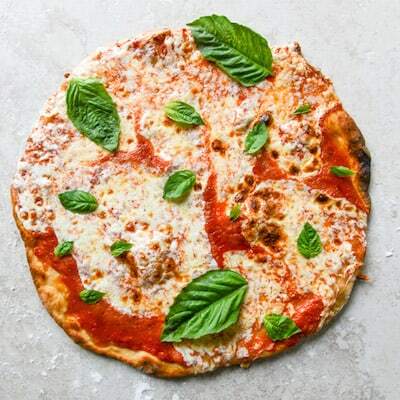 And that margarita pizza looks delicious too! 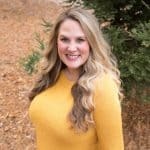 I love the idea of making a pesto chicken parmesan! Definitely going to have to try that one! Everything looks amazing (like always)!! That margarita pizza is callin’ my name right now, girl! 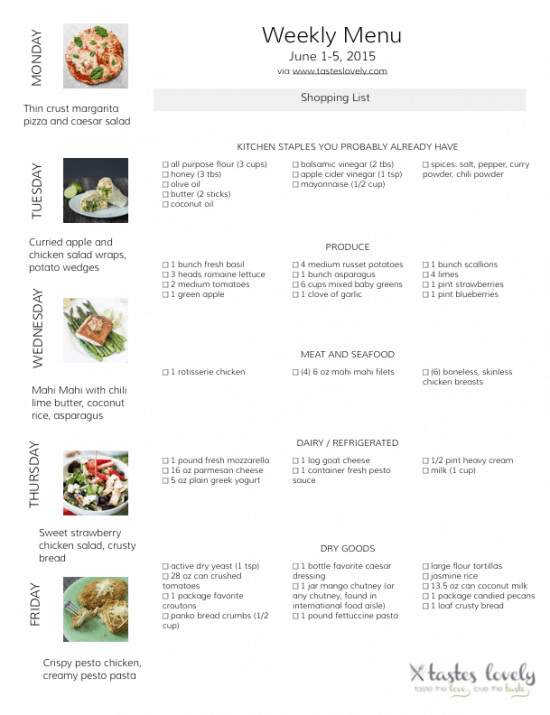 I love these weekly menus! They are such a time saver! And thanks for including my strawberry salad friend! !